The Kamal's Viswaroopam will release all over Tamil Nadu on February 7,” said Kamal in a statement. Following the tripartite talks on February 2 in the presence of Home Secretary R. Rajagopal, Mr. Haasan had agreed to edit a few scenes from the film, thus bringing to an end the protests by some Muslim organisations. 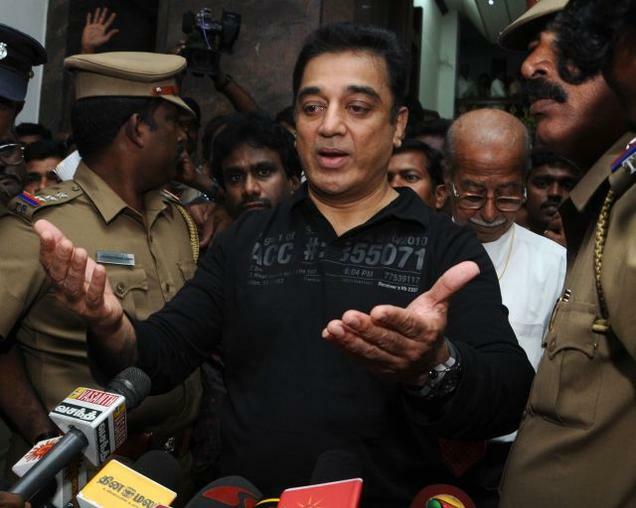 As a reason was suggested, that the judge was awaiting the result of Haasan's other case against District collectors, who gave orders to ban the film's release. The Hindi version Vishwaroop was released in over 1035 screens of 800 theatres on February 1,2013 ,thereby marking the biggest ever release for a Kamal Haasan film in Hindi.It was distributed by Balaji Motion Pictures.Chief Minister Jayalalithaa defended the government's action, stating it was not in a position to provide security across all 524 theatres where it was to be screened from January 25. Vishwaroopam truce finally reached in Tamil Nadu after talks between Kamal Haasan and Muslim groups on 2 February 2013 and the film is likely to release on February 7, 2013 in Tamil Nadu.7 scenes will be cut and some scenes deemed offensive will be muted.Muslim groups have initailly asked for 15 scenes to cut.Kamal Haasan said that he will withdraw the writ petition against Tamil Nadu government in Madras High court.Malaysian government will hold a meeting with distributor of Vishwaroopam to find a solution to lift the ban on it. The prohibitory orders imposed under Section 144 of CrPc to ban Vishwaroopam in Tamil Nadu was lifted on February 3,2013. The Rs. 95-crore espionage thriller was set for release in Tamil and Telugu on January 25, but a day before the release the Tamil Nadugovernment imposed a two-week ban fearing protests by Muslim groups. Written, produced and directed by Mr. Haasan, who also plays the title role, “Vishwaroopam” also features Andrea Jeremiah, Pooja Kumar, Rahul Bose, Shekhar Kapur and Jaideep Ahlawat. The film’s Hindi version “Vishwaroop” was released on February 1 across the country and has raked Rs.7.56 crore in its opening weekend.